With the right winter hiking gear you can enjoy hiking year round and avoid that inevitable winter flab. If you haven't gone hiking in the winter before, you are in for a treat. The same great hiking destinations that you love during the rest of the year will seem like a whole new world in the winter. You may already have a pair of waterproof boots, but you'll want your winter boots to have extra insulation. Many high-quality hiking boots have a temperature rating just like your sleeping bag. A half size or so bigger than normal is always a smart idea to allow for swelling of your feet on a long hike as well as providing extra room to layer your socks. Tight boots mean cold feet in the winter. Leather is your most comfortable option. However, if you will be doing a great deal of winter hiking or expect to be in extremely cold conditions, you should consider a pair of pac boots. One good choice is the Winter Range II Pac Boot from Cabela's. This boot is rated to 60 degrees below zero and has a heat pack pocket for those extra cold days. Obviously, you will wear socks. For winter hiking you will want to bring an extra pair. Don't be fooled into thinking that all socks are the same. Hiking socks will provide extra cushion and comfort and the best ones for winter will provide extra warmth as well.Smart hikers will also have a pair of wool liner socks. 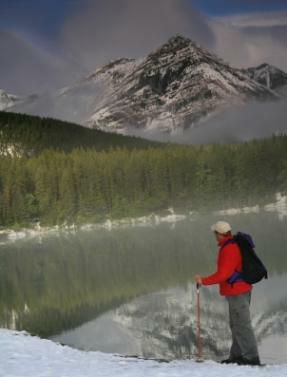 The extra warmth and moisture wicking will be appreciated when you are hiking in snowy conditions. You will appreciate having gaiters for your boots the first time you step into snow and sink down to your knees. Keep the snow out and keep your feet warm; you'll be able to hike longer and enjoy it much more when your toes are toasty. A good pair of snowshoes can help you cover ground that you normally would sink in. Modern snowshoes are smaller than earlier versions, which is a big plus. You can find the more old-style wooden snowshoes, but most modern styles are made of aircraft aluminum. This makes them lightweight and durable. 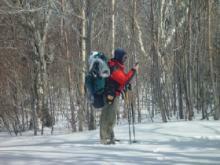 Snow poles are also a wise investment if you intend to do any amount of snowshoeing. They will help you keep your balance as well as being helpful for pushing off to get yourself moving. Many snowshoes have cleats on the toe and heel to give you better traction. You might also want to have a pair of cleats or crampons that will fit your boots when you are not wearing snowshoes. A great, lightweight choice is a pair of STABILicers Lite Ice Cleats from Cabela's. If you plan to camp, you will also need a durable winter camping shelter, a warm sleeping bag, cookware and a camp stove with extra fuel. Don't forget to also include toiletries and make sure you ALWAYS tell someone where you will be hiking and when you plan to return. This could save your life if you get lost on your journey. For a comprehensive list of winter hiking gear to pack, check out this of list winter gear for a hiking trip from the Harvard Outing Club. When dressing for a winter hike, think layers. With layers you can remove one layer if you get too warm or add one if you start to feel chilled. Avoid cotton at all costs in the winter. Cotton does not adequately insulate and can literally kill you out in the cold weather. Layer One: This is your base layer. Choose lightweight, thermal underwear that will wick moisture away from your skin. Layer Two: This middle layer should be insulating, like Microfleece. Layer Three: The outer layer needs to be wind and waterproof. Make sure you have a hood to keep your hat from getting soaked while it is snowing. Plan your winter hiking gear carefully and stay warm and dry. By following these tips you can enjoy hiking no matter what season it is.